Hi all. It may look like Bierebelle has left the building but I assure you I am alive and well. Just very very busy but I’m quite excited about putting some blogs together about my recent trip to Vancouver during their Craft Beer month. I am pretty sure you will be eager to book your flights when you see the amazing variety of beer out there by the most creative collection of brewers I’ve seen outside of the North of England. However, since my return to the UK I haven’t actually been home long enough to write anything, with long, tiring days at work, a trip to London and a weekend away in Bristol for the OH’s birthday. A special occasion such as the OH celebrating another year wiser was the perfect excuse to break open a rather lovely looking bottle we had been saving for a while, Mikkeller‘s Beer Geek Bacon. 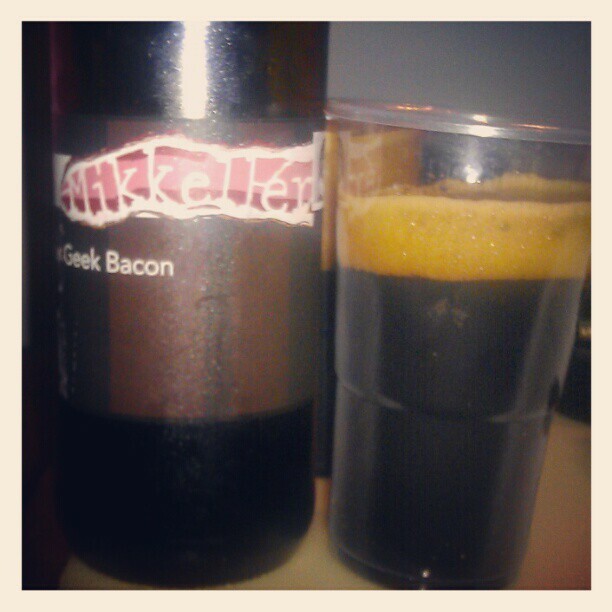 It’s the smoked version of his amazing Beer Geek Breakfast espresso stout. Since we had just secured tickets to the Copenhagen Beer Celebration, this was pretty appropriate. Although I would normally only drink a breakfast stout for breakfast, we drew the line at the 07:05 train, unlike the chaps who got on a stop later with their bottles of Stella. I’m glad we waited until we were checked into the hotel as this beer was worth savoring. It was one of the blackest beers I have seen with a gorgeous tan head and delicate bubbles and an aroma of mouth-watering smokey caramel. It had the most satisfyingly smokey taste I have had in a smoked beer for a long time and finished with a lot of salt, a little like really crispy, almost burnt bacon glazed with a golden brown sugar. There’s even a hit of wakey wakey espresso and he burnt smoke lingers on the tongue for a long time after the final sip. A delicious breakfast in a glass and I didn’t even set off my smoke alarm with the grill to enjoy it.